It turns out that two people (me and Mom) living together in a rather small one bedroom condo was a bit too stressful. This was probably predictable but it took trying it for a few weeks to be sure and moving was going to take a lot of effort and more stress. But it was soon obvious that we needed to find a place that would be large enough for the two of us and met several other requirements. First of all, it had to be all on one level so that Mom didn’t need to navigate steps – although she does manage when there is a hand rail and/or someone to hang onto. Still, having everything on one level is ideal. The second requirement was that the place was carpeted to minimize the chance of slipping on a throw rug on hardwood floors and to minimize the impact of a fall should it happen. 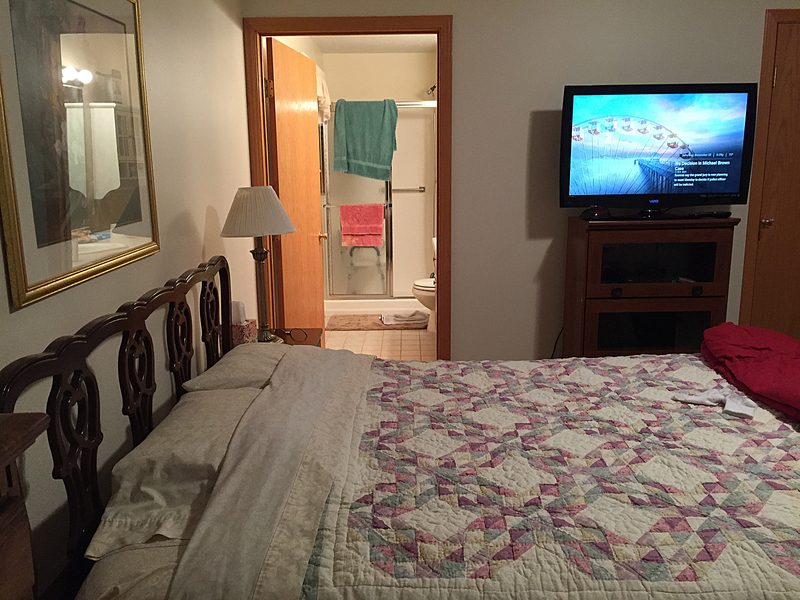 Third, we needed two bathrooms so that Mom could have her own with all her stuff in it and I the same. And it happened more than once in my condo where one of us had immediate need of a toilet while it was otherwise occupied. So two bathrooms was a definite necessity. Fourth, Mom’s bathroom needed to have a walk-in shower so that she could enter without stepping over a tub wall. Fifth, Mom’s bathroom needed to be large enough so that she could push her walker into it and turn it around and use it to assist her in sitting down and getting up again. Sixth, Mom’s bathroom needed to be as close as possible to her bed so that when she got up in the middle of the night she would not have to navigate a long path to the toilet. This was important for a couple reasons. The most obvious one is that the further she has to walk in a sleepy state in the dark, the greater the chance of a fall on the way to the toilet. But also, her bladder isn’t what it used to be so a nearby toilet minimizes the chances of another kind of accident on the way there. What are we up to, seven? OK, I need my own bedroom. Sleeping on the couch was not great even though the couch was as comfortable as any bed I have ever owned. It was just too hard to coordinate our go-to-bed times so that Mom would leave the living room to go to her own room when I was ready to hit the sack. Requirement eight: I need an office and workshop space so that I can work on my business and my projects without leaving Mom alone or with someone else or have someone come in to Mom-sit. Requirement nine: the new place needed to be close to my sister Nancy and my niece Arianna and her husband Shane. These people are my family in Minnesota and my support system and both Mom and I really need to be close enough to them to visit or get assistance when needed. Finally, requirement ten (whew! ): The place needed to be affordable and for us that meant under $1400 a month. So how would it be possible to meet all these requirements? It seemed a daunting task. I started out searching Craigslist for places that were close to Ari’s house and found some that met a lot but not all of the requirements. I sent these on to Ari for her feedback. Being the smart, resourceful go-getter that she is, she took it onto herself to help in the search. She extended the search to an area a bit further north of where I centered mine and in one day she turned up the most amazing – I would even say perfect – place. Not only did it meet all ten requirements but it went way beyond them. It is a single-level townhouse – the end unit of a fourplex. 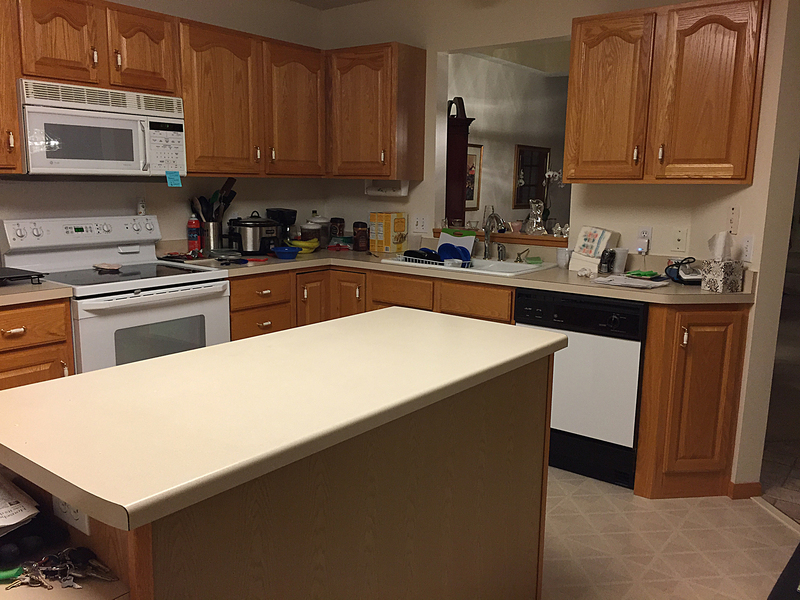 It looks brand new even though it is twenty years old and it has what appear to be all new appliances, including a dishwasher, electric oven, and a combination microwave and convection oven. The kitchen is larger than any either Mom or I have ever had. It has a center island for food preparation and a breakfast area with a window on the world. 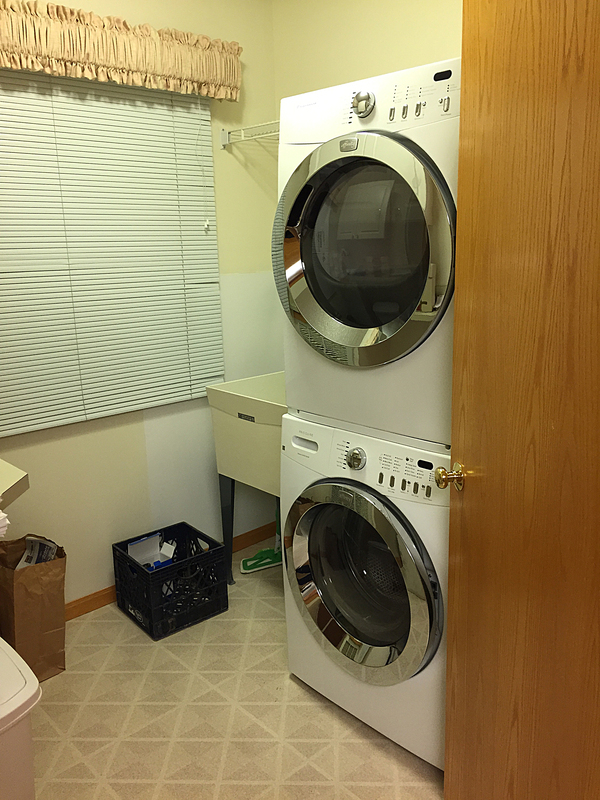 It has a laundry room off the kitchen with a washer/dryer stack. Central heat and A/C. 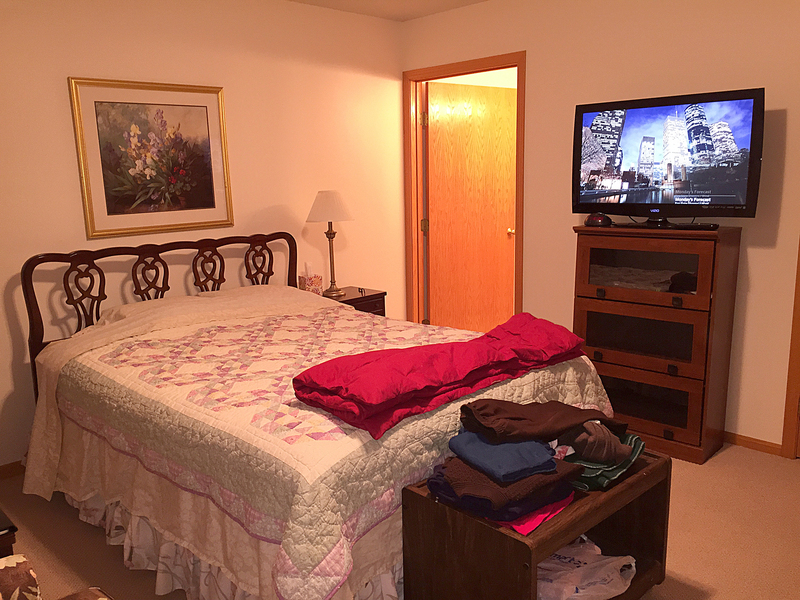 The master bedroom is so big that it would accommodate all Mom’s bedroom furniture plus a couch and a bookcase on which to put her flat screen TV. 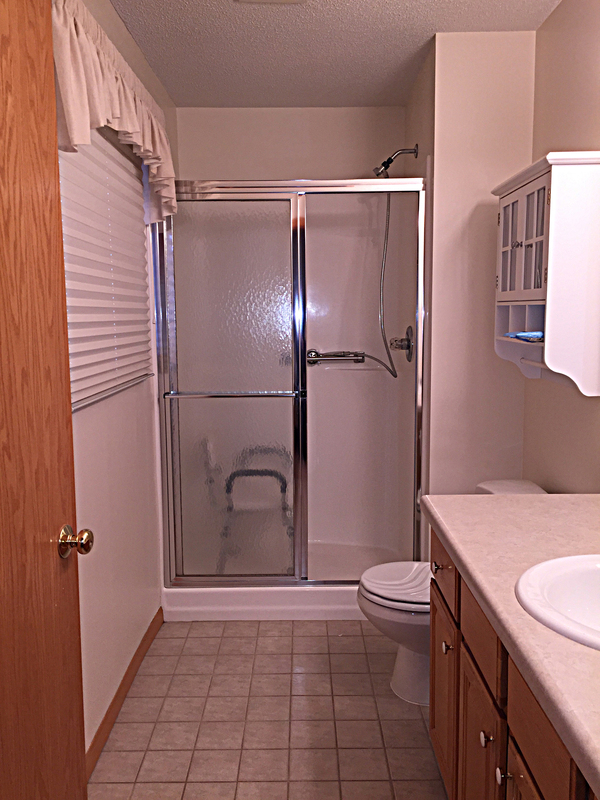 Her bath is off the bedroom and has a walk-in shower and easily accommodates the walker. She has to walk three feet to get from her bed into the bathroom. The living room is very large – again larger than any she or I have ever had before. There is a large dining area next to the living room with a pass-through to the kitchen. 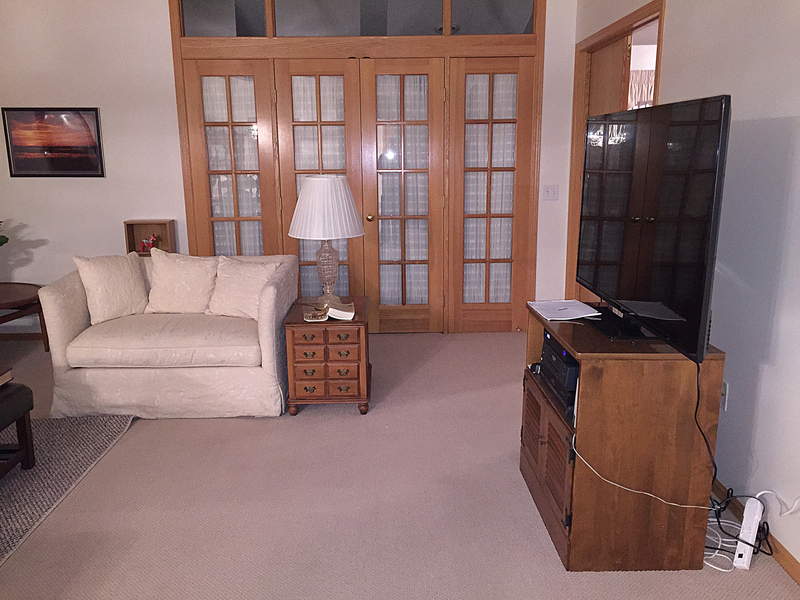 There is a sun room attached to the living room that will become my office and it is plenty big for the task. Finally, there is a two-car garage with lots of storage space and it will double as my workshop. And the rent is only $1350. 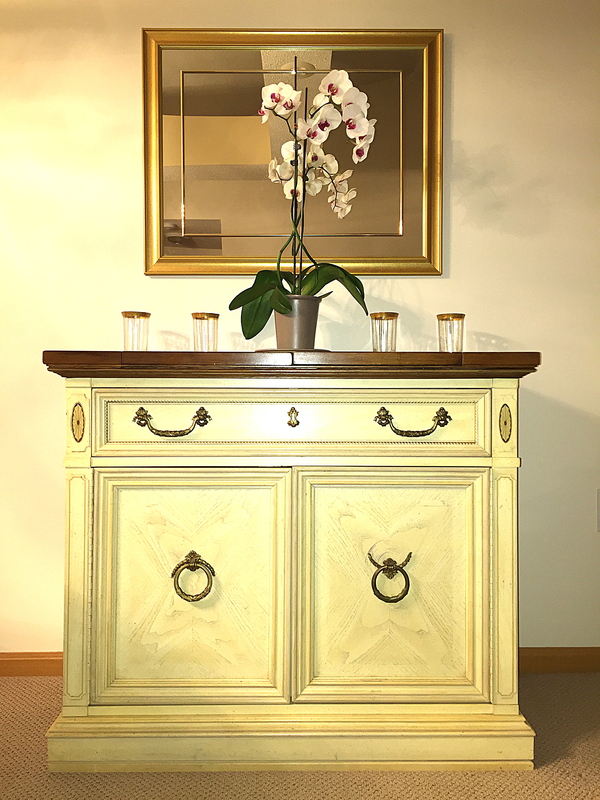 The owners listed it at $1395 but when they saw what a great pair of tenants we would make (he said modestly), they dropped it to $1350 without our asking. So, enough words. Let’s see some some pics. Starting with the kitchen, this is the view when you come in from the garage. Actually there is a large closet on this side of the refrigerator that didn’t make it into the photo. And this is our breakfast area. The laundry room is off the kitchen. The washer and dryer appear to be nearly new. The dining room is just past the kitchen and there is a pass-through. 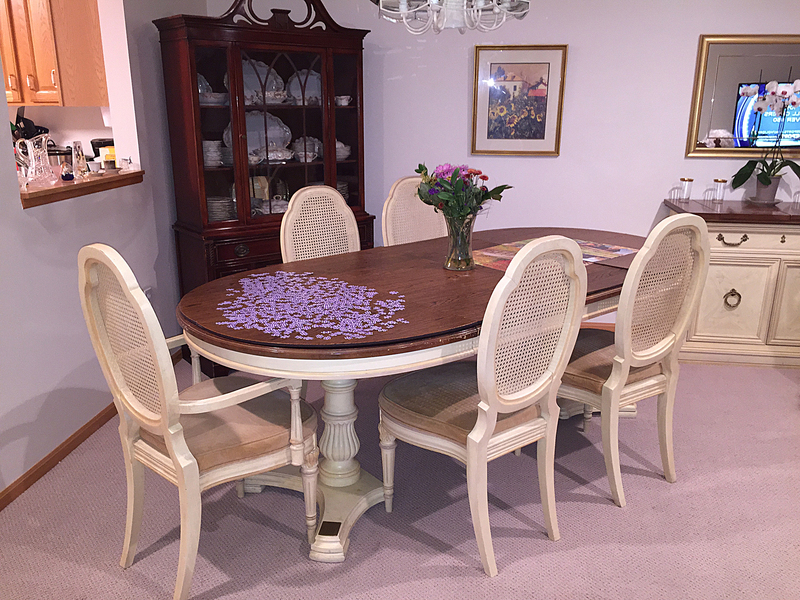 It is large enough that we can have all the leaves in the dining room table and have lots of room to spare. 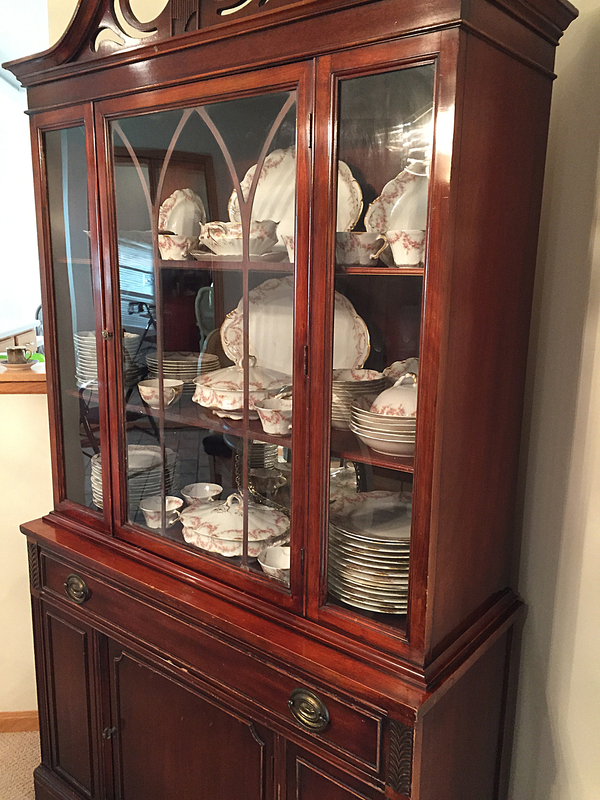 Mom’s Haviland China looks really great in the hutch. 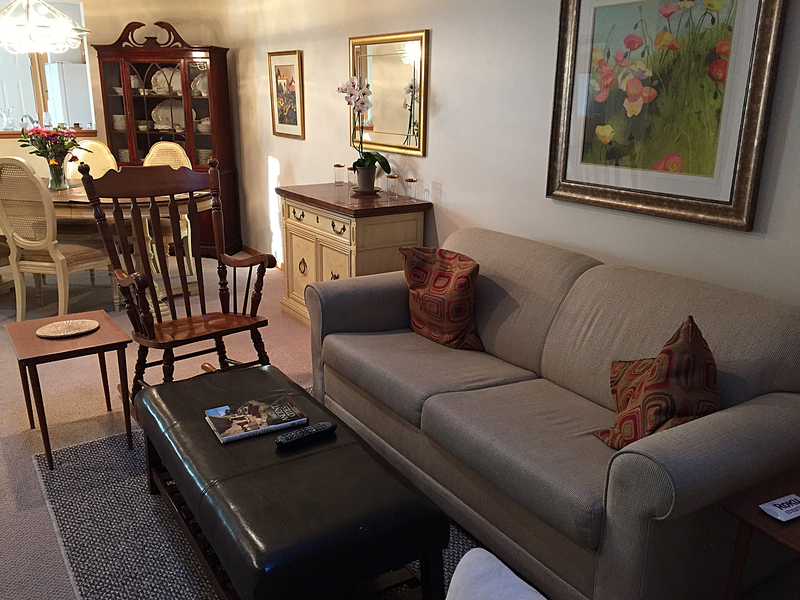 The living room adjoins the dining area and is very spacious. 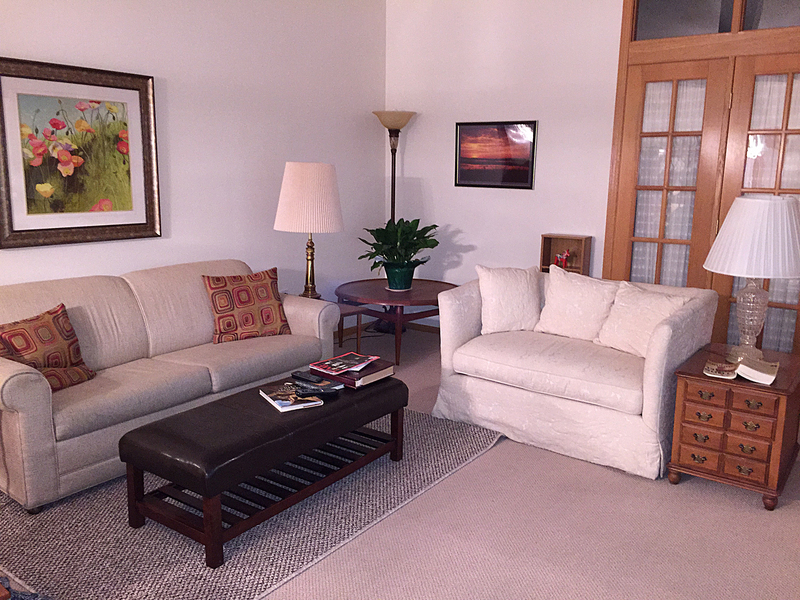 It is set up pretty much like Mom’s old living room. The sun room is in back of the living room. There isn’t anything in there yet but I will be moving a desk and some cabinets in soon. Mom’s bedroom is off to the right in the rear. The master bedroom is quite big. You can see how close the bathroom is to her bed. 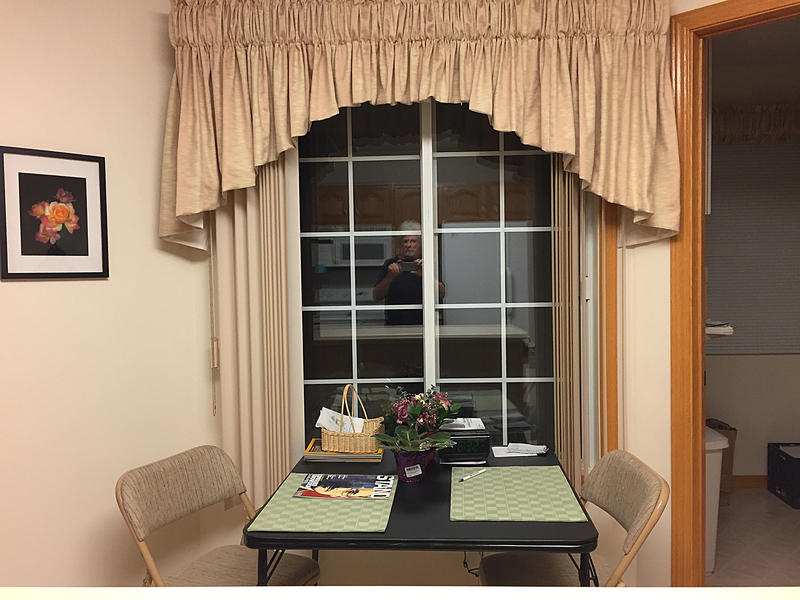 The couch in the bedroom is in front of a picture window where Mom likes to sit and watch TV or play FreeCell on her iPad. 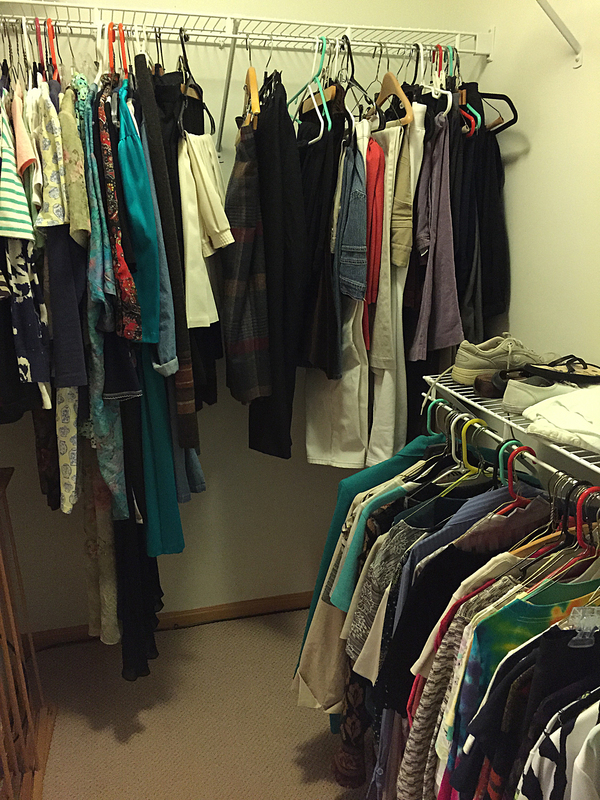 Oh, did I forget to mention the walk-in closet? Well, that’s about it for now. I will add photos of the outside and the garage and a few other things in another post. Oops, I almost forgot to include some photos of the star of this blog. This one was taken her first day in her new home. And one from when she was living at my condo and before winter blew in like the wicked witch of the North. Helen Chapman is my mother. 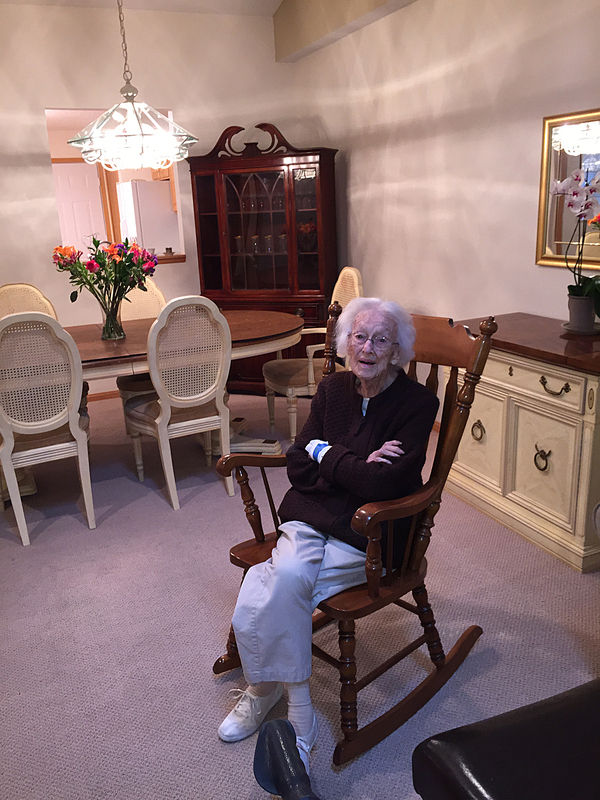 She turned 98 last August. 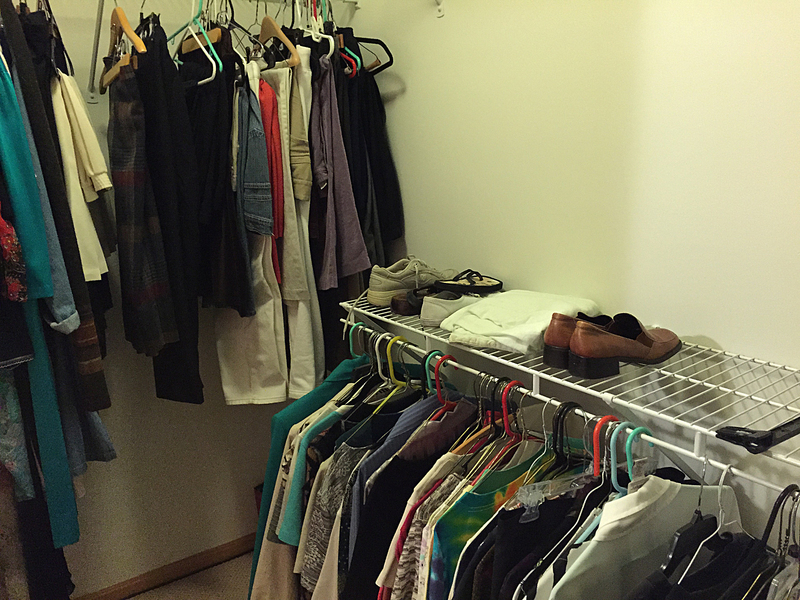 Mom had been living independently in her own condo until very recently. I saw to most of her needs but she is unstable on her feet and had fallen twice in the two weeks preceding her recent hospital stay. Neither fall was serious although she did tear a patch of skin on her forearm in one of them. She also has short term memory problems resulting from a stroke that she suffered about 8 years ago but that doesn’t really affect her ability to function. Her long term memory is pretty good but more and more she is not able to recall things like when she moved to Minnesota or what her last job was. On Thursday, October 16, I got a call from someone in her condo building that she was in the lobby talking strangely and unaware of where her own condo was. This was not usual behavior for her so I rushed right over. (I live in the next building.) When I got there she as clearly confused and was having auditory hallucinations – constantly hearing music. She was talking about wanting to call her sister-in-law, who passed away a year ago, so that she could in turn call Grandma, my mother’s mother who has been dead for almost 50 years, and tell her that she was coming home. This was eerie and upsetting to say the least. The woman who called me accompanied me and my mother back to Mom’s condo and we talked for awhile until we all gained some composure. I left Mom in her condo for awhile and returned to my own condo to take care of a few things but soon I got another call from someone else in her building telling me the same story as before. This time I went over and got Mom and brought her back to my condo. Norma is Mom’s best friend and she lives down the hall from me. I called her and invited her over. The three of us talked for an hour or two and, while Mom recognized and was happy to see Norma, she continued to hear the music and make odd comments. As soon as Norma left, I decided that I needed to bring Mom into the emergency room to see if there might be a medical reason for her sudden change. My older sister thought that it would be useless – that Mom was just demented and that there would be nothing that fix that. But the suddenness of her decline made me uncertain if that was true. So off we went to Methodist Hospital ER in St. Louis Park. And I am glad we did. Mom was diagnosed with a UTI (urinary tract infection) and minor dehydration and was admitted to the hospital. That night they put her on a saline drip for the dehydration and an antibiotic to kill the infection. The doctor explained that they immediately suspected the UTI because of the sudden confusion. He explained that what she was experiencing was delusion, not dementia, and that it is a very common result of infections in general and UTIs especially. He gave me an information document about delusions and it described exactly what had happened to Mom and even said that the most common cause in elders is infection. Apparently the infection causes a chemical change in the brain that in turn causes the delusions. This was all news to me but a very important thing to know if you have older relatives or friends who have a sudden change in behavior. Interestingly, Mom did not have a fever. By morning her infection was gone and she was no longer hearing music. Her confusion was not completely gone but she was no longer obsessing about letting her mother know that she was coming home – which was a big relief to me. Before releasing her, the doctor wanted Mom to be examined by both a physical therapist and an occupational therapist. The PT determined that she was not stable enough on her feet to be released to her own condo. She had to have 24-hour supervised care from now on. The occupational therapist did a mental capacity test, which Mom did very badly on, scoring a 4 out of 30. It was very painful to watch her struggle through the test. She confirmed the decision of the PT that Mom could not return to independent living. It took all day Saturday for the damn doctor to get back to us about releasing her – not answering her page or phone calls from the nurse for six hours. (I hate hospitals and the interminable waiting.) 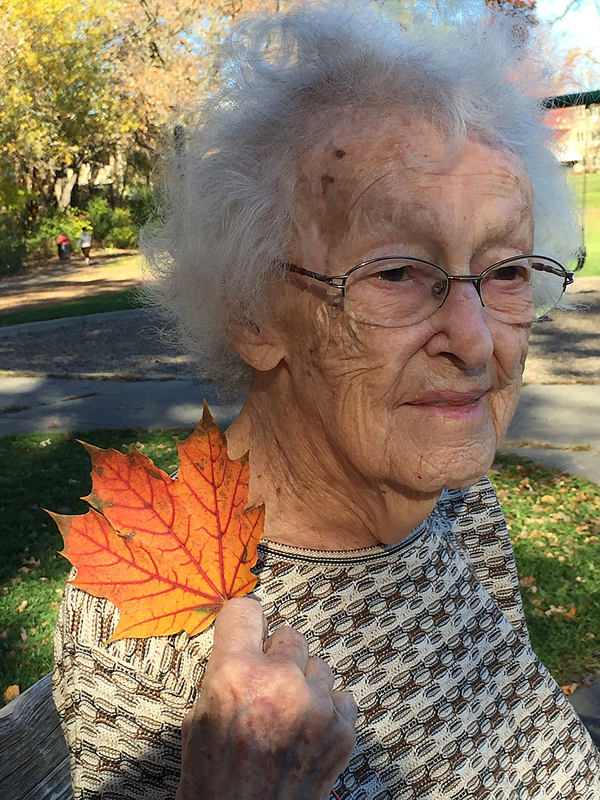 But finally she sent in a release order and after the nursing staff set up home visits from a nurse, a PT, an OT, and a personal care (bathing and hair washing) professional, she was released to me – as long as I indicated that she would come home with me and not back to her condo. And so it is now that Mom is sharing my one-bedroom condo with me. It has been 11 days now and there are challenges but Mom is getting much better. Her weight as of Monday was 100 lb, up from 96 when she went into the hospital. We are eating three meals a day,something that she was not doing when living alone. I always saw that she had a good evening meal but breakfast and lunch were up to her and more and more she wasn’t fixing anything for herself. So this is a big improvement. I also try to enforce the no-walking-without-the-walker rule and she is pretty good about it but sometimes wanders down the hall to the bathroom without it. I do gently scold her though and the PT and OT and nurse who visit us twice a week each, all reinforce need to be good about using her walker. I also make her drink a few glasses of water every and she always grimaces a bit but then downs the whole glass. So that is another big improvement – she hardly ever drank water before. Today the home care OT came and re-administered the mental capacity test (I don’t think that is the exact name). It was the identical test that she took in the hospital but this time she did much better, scoring 14 out of 30. It is still a little painful to see her struggle to answer questions that she wouldn’t have had any problem with even a few months ago. Well, that’s it for today. I took videos when she was doing her PT exercises and will post them and some photos as soon as I figure out how to do it with WordPress.